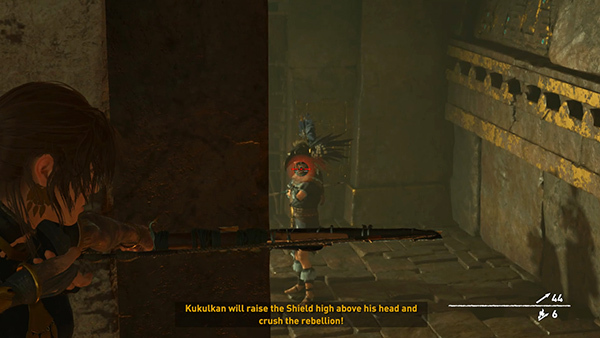 When you're finished searching the courtyard where you defeated the first large group of Amaru's followers, head for the south end of the courtyard and climb the wooden slats to the ledge above the closed door. 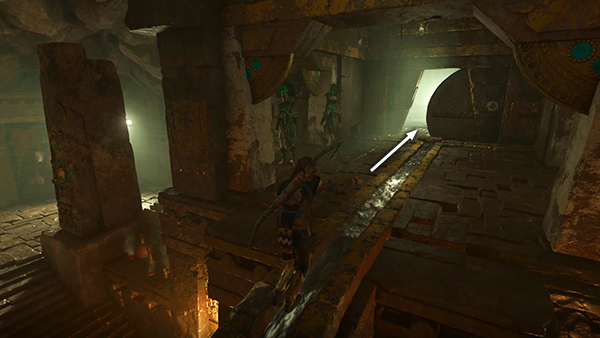 Sneak through the rectangular opening into the next room. There are 7 more cultists between you and the exit, but you don't have to fight any of them if you don't want to. 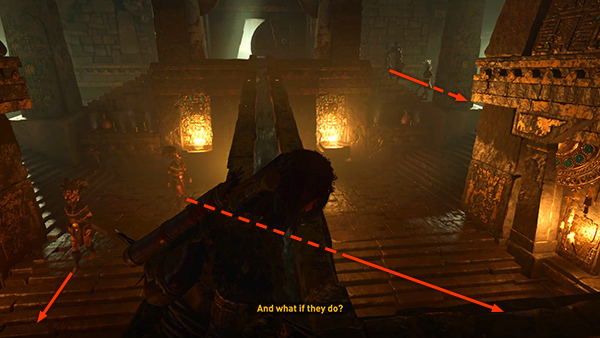 To sneak through without alerting anyone, wait for the pair on the left to move into the corners below you and the 3 on the right to move down the stairs to the landing. Then walk quietly across the stone aqueduct carrying water down to the next room. 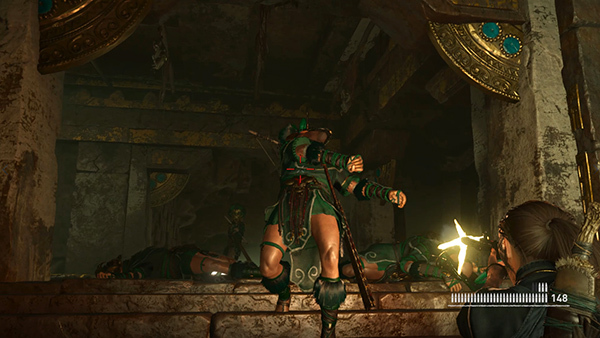 Stop just before you reach the end, as 2 Serpent Guards cross directly in front of you. 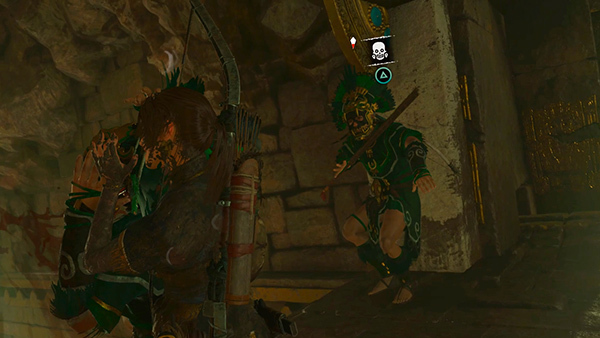 Their masks must prevent them from noticing Lara, even though she's standing in plain sight. 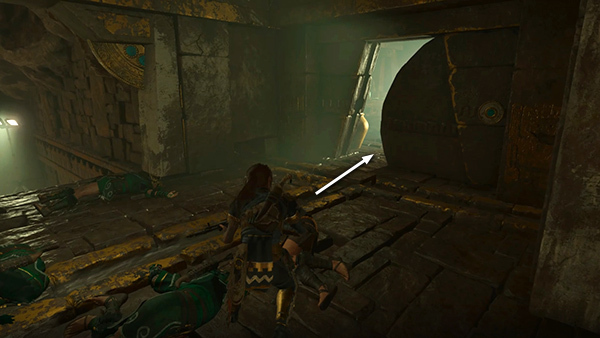 When they stop, just to the left of your position, you should be able to sneak past them and squeeze through the partially open door into the next room. They won't pursue. 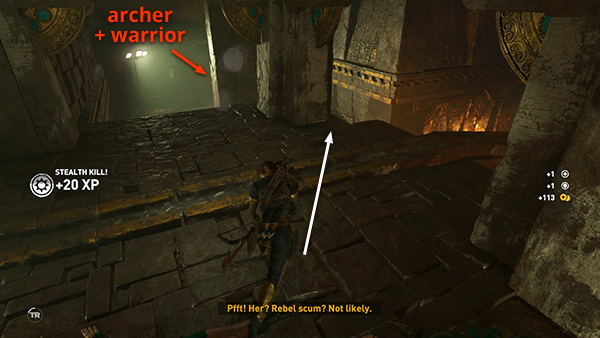 If you'd rather fight—and get all the gold and other goodies the cultists drop—that's fine too. 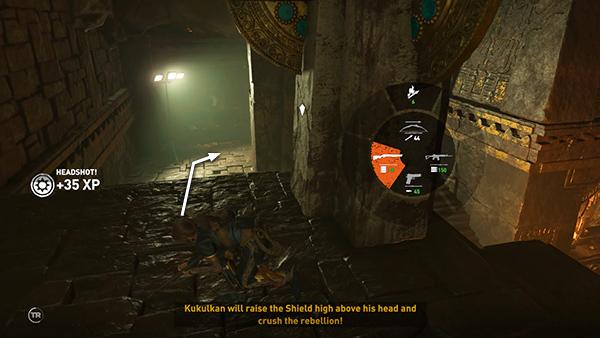 If you have the Serpent's Fury skill, you can even the odds a bit by taking out a few enemies with stealth before you engage. 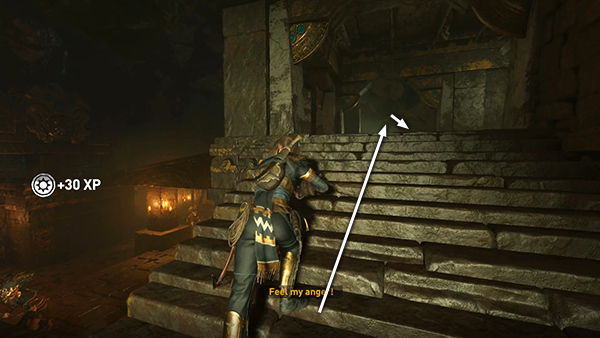 Start by doing everything described above, except instead of sneaking through the door, approach the 2 serpent guards from behind. You'll see separate Melee icons over each enemy. ...then again for a chained takedown. 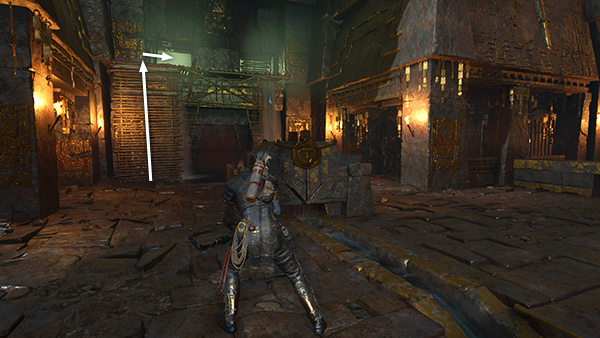 Move behind the square column on the left side of the aqeueduct trench when facing the entrance. 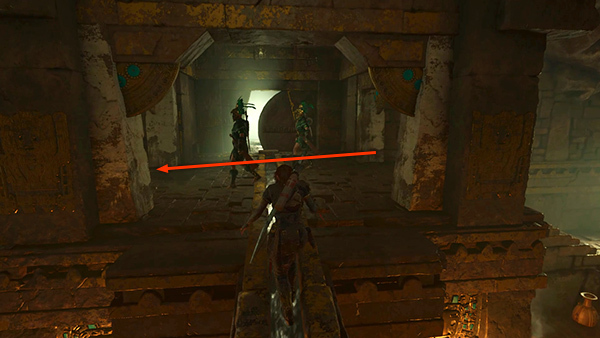 If you peer around the right side of the column, you should be able to land a headshot on the Eagle Archer standing on the landing halfway up the stairs. ...and take him out next. 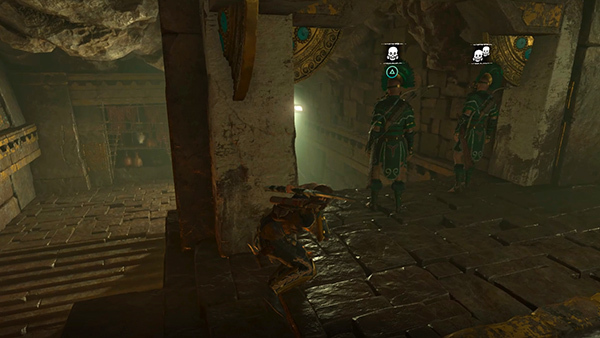 That leaves only 4 enemies: 2 Jaguar Warriors near the entrance and 2 more Serpent Guards. If you like, you can stand your ground and meet them as they come to you, but you'll probably have better luck if you keep moving. Run up the stairs and partway down the other side. Heal if necessary and use endurance herbs (and focus herbs if you've unlocked that skill) as you go. Don't bother crossing back over to the ledge where you came in. 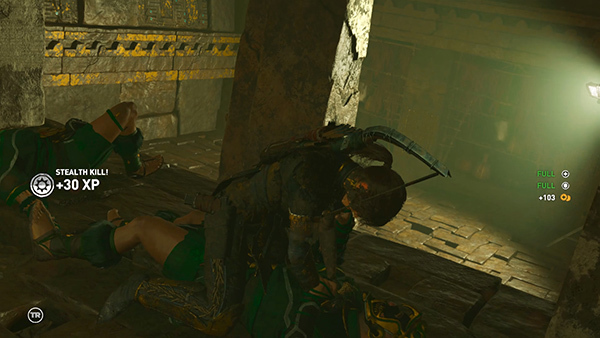 The men will see Lara and start tossing explosives at her. 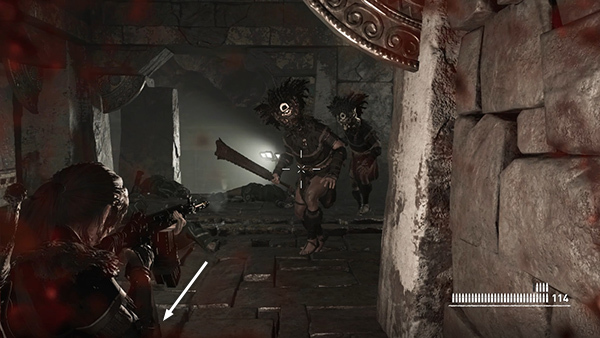 Shoot the 2 nearest enemies as they approach. Then turn and deal with the others, backing up as they come at you. 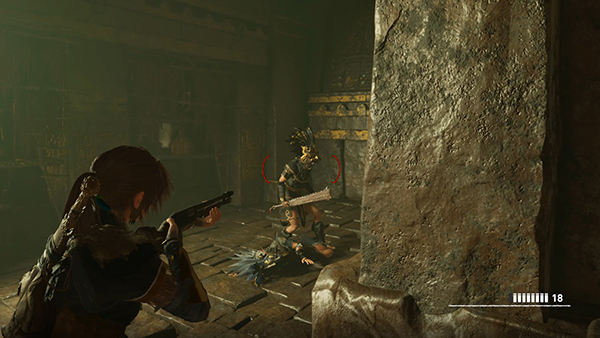 If you get boxed in and Lara starts losing health too fast, try to break out and keep running and healing until you're strong enough to turn and fight again. 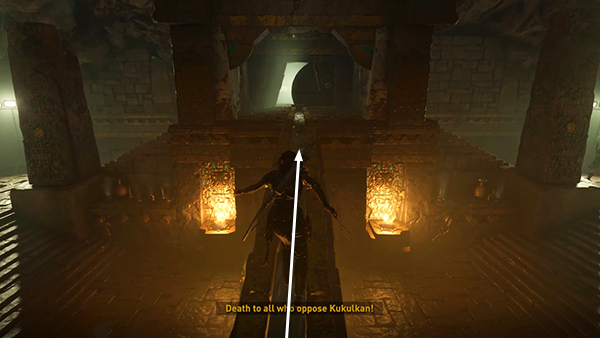 When you've killed all of them, loot the bodies for feathers, arrows, herbs, and gold; craft arrows, etc., if you need them; and move through the doorway at the top of the stairs.